88-key digital piano power supply, music rest and sustain pedal. 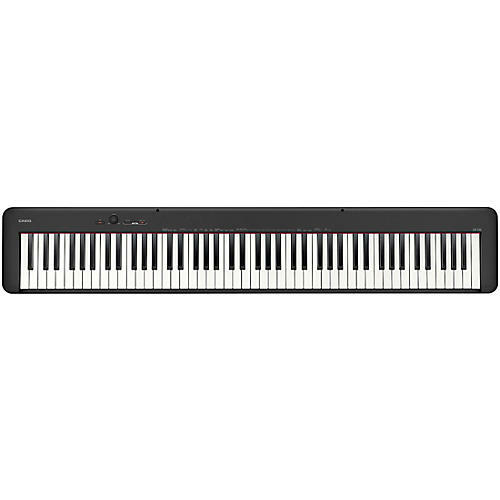 Redesigned from the ground up, the CDP-S100 redefines value in a digital piano. It's a perfect piano for students, hobbyists, or pianists who need grand piano sound and feel in a small space. A newly-designed scaled hammer action keyboard features precise key weighting on each of the 88 keys, with simulated ivory and ebony key surfaces. More than 40% smaller than other brands' instruments, the CDP-S100 delivers piano authenticity in a slim unibody case that's barely larger than the keys themselves. Weighing only 23.1 lb. and capable of running on AA batteries, the CDP-S100 provides unprecedented levels of portability and convenience. A beautiful stereo grand piano sound is complemented by 9 additional Tones with adjustable reverb and chorus. Listen via the built-in stereo speaker system or practice quietly at any time with your favorite headphones and the built-in metronome. Download the free Chordana Play for Piano app, and connect via USB to your favorite iOS or Android device to make adjustments to your CDP-S100, as well as play your favorite MIDI files. The CDP- S100's USB port is class compliant, and can also connect to any Mac or PC with no drivers or installation needed. Includes power supply, music rest, and sustain pedal. Optional matching wooden CS-46 stand available separately. A perfect practice piano for any room, order the CDP-S100 today!